Whenever I criticize Satmar, I am immediately pointed to their Bikur Choilm Society. This Chesed group is renowned for serving the sick among Israel. There is no doubt about that. They visit the sick in ways that few others do. Among the many things they do is provide hot meals not only for the sick, but for any relatives staying with them in hospitals. Satmar Bikur Choim volunteers do not ask which denomination a patient or his family members belong to. Or even ask how religious they are. It does not matter to them. They see a Jew in need and they help them. All I can say about that is that Hamas is known for doing Chesed for their coreligionists too. Now before anyone jumps all over me for comparing Satmar to Hamas, I’m not. Obviously Hamas is a murderous terrorist organization that kills innocent people indiscriminately for their cause. Satmar does not do anything near that. I make the comparison in order to point out that doing something right does not absolve anyone for what they do wrong . The wrong Satmar does to the Jewish people is their absolute and unremitting hatred and bashing of Israel. They stop at nothing to get that message out. That is at best disingenuous. Loving the land is not the same as loving the state. Satmar is known to oppose Jewish sovereignty over the land until such time as Moshaich comes. Our presence there as a sovereign nation is a violation of God’s dictates -as per the Satmar Rebbe’s interpretation and application in our day of a Gemarah . Even if Israel was fully governed by Charedim, they would still be opposed to its existence as a state. 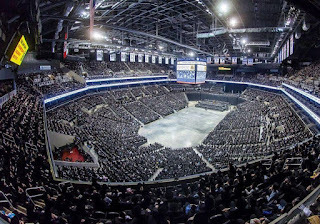 Close to 20,000 Orthodox Jews gathered on Sunday at the Barclays Center basketball arena in Brooklyn to protest the Israeli law mandating Orthodox conscription into the IDF, which they described as “Israel’s persecution of religious Jews”. Rabbi Niederman calls this a violation of religious freedom and considers Israel’s conscription law to be a violation of the agreement made with the Charedi world at the founding of the state. Which was to exempt Yeshiva students from the military. What he does not tell you is that Yeshiva students are not conscripted. They are still exempt as long as they are in the Yeshiva. What has changed is that they must now all register with a draft board. Much the same way I did in the US when I was in the Yeshiva in the late 60s and early 70s. At that time all able bodied men were subject to the draft and serving in the military. Yeshiva students like me were exempt. But we still had to register under penalty of law if we didn’t. Now I have no issue with exempting members of the clergy or students studying for it from the military. My objection only begins when every able bodied male of an entire community becomes a yeshiva student – thus exempting everyone in it. This was not the case when the agreement was made. There were a few hundred Yeshiva students at the time. Now there are tens of thousands! Be that as it may, The Israeli government has seen fit to honor its former commitment and not draft sitting Yeshiva students into the army. However, they must still register. Later in May, several dozen haredi extremists descended on Almoz’s private residence and protested against the enlistment of haredi men, although the indictment did not mention Iraam in connection with these events. This rally is just more of the same. The arguments put forth by Rabbi Neiderman defending this rally do not hold water. Even if you agree with him about Israel not needing Charedim to fulfill IDF manpower needs, as I said, Israel isn’t drafting Charedim now. They are only asking them to register and exempting them as long as they stay in a Yeshiva or a Kollel! Nor is it legitimate for him to claim that Israel’s whole purpose for the draft is to change the character of the Charedi Jew. This is evidenced by the advent of Charedi units. And by the fact that Charedim have been given the option of doing community service as a fulfillment of the military obligation. Let us be honest. This is yet another opportunity for Satmar to bash the State of Israel. Why is this acceptable to the more moderate Charedi leadership of the type associated with Agudah? They know that the Charedi world in Israel has achieved unprecedented success in Torah study. As noted there are tens of thousands of men studying Torah full time without any interference. They are very aware that the Israeli government helps support them financially in a variety of ways. They realize that Israel has provided the infrastructure that enables all its citizens - including Charedim - to live in the relative comfort of a civilized world. They are quite aware that the IDF helps protect them from being annihilated by Israel’s enemies. I don’t understand why the more moderate segments of the American Charedi leadership does not condemn this event and Satmar for organizing it. Why do they only reserve their condemnation for the left? Is there no one on the right that ever deserves condemnation? How can they look the other way when 20,000 people show up at a rally to protest something that isn’t even happening the way they say it is? …to protest a nation that has given Torah study such a favorable home? Is this not a Chilul HaShem? Doesn’t their silence have the appearance of agreement? Why can’t the moderate American Charedi leadership follow the lead of the moderate Charedi leadership in Israel? Let them condemn Satmar - the same way their moderate counterparts in Israel have condemned Peleg! Really? Is this the kind of unity they seek? Why? Because Satmar Chasidim look so Frum?! The time has come for the more moderate American Charedi leadership of the type that is associated with Agudah to speak up . Peleg and Satmar are one on this issue. And they deserve the same treatment. Agudah fears creating yet another rift? I say let it happen. As long as they continue to publicly hate and disparage Israel, I can think of no better group to separate ourselves from than Satmar.